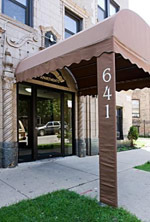 641 Aldine is located two blocks north of Belmont near Broadway in one of Chicago's most interesting, eclectic neighborhoods. Built in 1920, this seven-story elevator building has been renovated to offer comfortable studio apartments with fantastic views in an excellent location. All apartments enjoy separate kitchens, ideal for people with an active lifestyle. With utilities included, all the resident pays with the rent is all, internet and cable. 641 makes living in a great neighborhood simple and affordable!